Minimum of 6 months experience in program management and oversight. Programs targeting underserved areas or populations in MANNA’s service region OR Programs that run innovative feeding programs geared toward connecting at-risk populations with nutritious food (i.e. MANNA Fresh Markets). 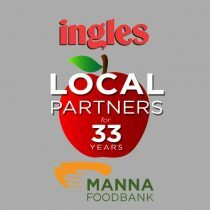 MANNA FoodBank as well as all of our partners throughout 16 counties are a part of the Feeding America network – the largest domestic hunger relief organization in the country. The common mission is to feed America’s hungry through a nationwide network of member food banks and engage our country in the fight to end hunger. We aim for collaboration to provide excellent service with respect, integrity and urgency while being mindful and inclusive of our diverse population. We take our stewardship of donated food and money seriously and strive for transparency and accountability. Feeding America provides a framework of best practices and a network of collaboration that enables food banks – that’s MANNA – to gather, store and distribute food to partner agencies. Those invaluable partners are the outlets that actually interact with the general public. Our partners are mostly donation funded and volunteer run; they provide much of the labor that gets food to the tables of families that need it most. Click Here to learn about becoming a 501(c)3. If you are interested in becoming a partner agency, watch the video below for a quick overview of the process. MANNA aims to serve those in need of food. Some areas of Western North Carolina have more pantries and meal providers than others. Since we do not have an unlimited amount of food, we encourage and prioritize new agencies that will serve currently underserved populations. For some food insecure families, finding a box of food can mean a real challenge when transportation and money for fuel is not readily available. We encourage those inspired to work in hunger relief to check out the pantries and feeding programs that may already be active in your area before taking steps to become an independent partner agency. If you are ready to pursue becoming a partner agency, the next step is to complete the pre-application checklist below and send it to the address on the form. When signing on as a partner agency, you will be required to complete MANNA’s Partner Agency Agreement as well. Thank you for joining in the work to end hunger in WNC!